The Centre attempts to create awareness not only amongst students but also the general public by aiding young entrepreneurs in their endeavor to get their work registered and initiate research into relatively unexplored and novel areas. To promote awareness of Intellectual Property Rights among students by conducting various events such as seminars, workshops, conferences and short-term courses. To proactively analyze future trends and enhance research and expertise in the emerging trends of Intellectual Property rights through publications. To develop advocacy skills in students with an interface of Intellectual Property Rights. To develop Intellectual Property Law database for the benefits of students and college. To identify and solve problems and dilemmas in the present Intellectual Property administration landscape. To create and to disseminate knowledge on Intellectual Property Law among the members of the public and contribute to the growth of the society. To utilize regional as well as state-level expertise of professionals in the domain of Intellectual Property Law and by imbibing such expertise into an industry-oriented Intellectual Property Law training centre. 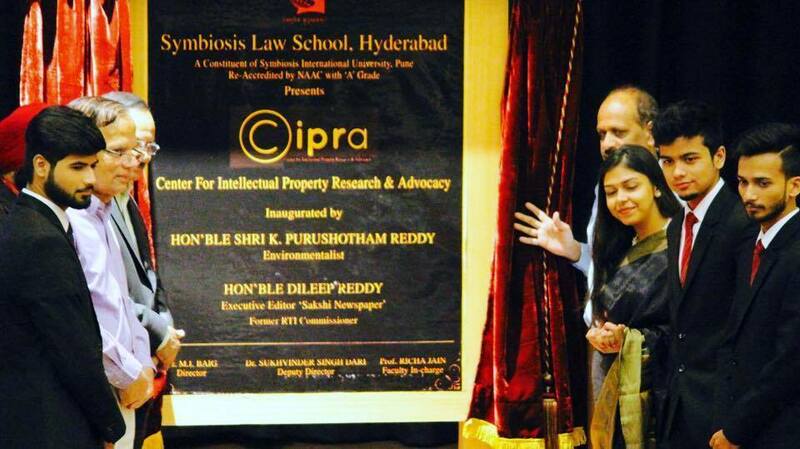 On 20th of October, 2016, Symbiosis Law School, Hyderabad inaugurated the much anticipated Centre for Intellectual Property Research and Advocacy (CIPRA). The Centre was inaugurated on the 2nd day of Coherence: International Multidisciplinary Law Conference by the hands of Hon’ble Shri K. Purushottam Reddy and Shri Dileep Reddy. Shri K. Purushottam Reddy, a fierce environmentalist and social achiever congratulated Symbiosis Law School, Hyderabad for the inauguration CIPRA and appreciated its vision and also assured his help and support for CIPRA’s future endeavors to come.